There was a significant fiber M&A development in the far northeast today. Oak Hill Capital Partners has entered into a definitive agreement to acquire Oxford Networks, following up on its previously announced deal to acquire FirstLight Fiber. 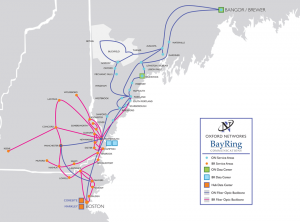 Oxford Networks operates a fiber network that spans the markets of Maine, New Hampshire, and northeastern Massachusetts, and in its current form was the product of consolidation over the past few years already. The Montreal-based PE firm Novacap bought Oxford Networks for $50M in 2014, and then acquired BayRing Communications to integrate into it. The combination of these assets with those of FirstLight Fiber, which operates a fiber network upstate New York, Vermont, and New Hampshire has always seemed like an obvious potential move. The only question was how the money guys would make it work. So now we know how. Oak Hill made it happen, but Novacap, Riverside, and Bank Street Capital Partners will remain as minority owners alongside them. The overlap in New Hampshire will provide synergy opportunities, while the broader network footprint will open up new opportunities that span the region. When combined, the two wil have a 4,800 route mile network footprint with 10 data centers. The obvious followup question will be what is next on the M&A list? Is Oak Hill looking to continue its roll-up into adjacent territories? Or might there be an organic push ahead, moving either south into lower New England or west through New York State toward Rochester and Buffalo? Well, first they'll have to close the deal, and then get through the coming integration with FirstLight Fiber. The transaction is expected to close during the fourth quarter.